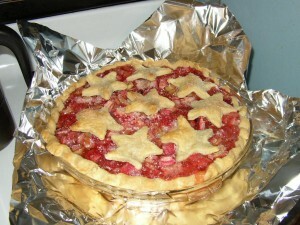 Just finished the last piece of my first Strawberry-Rhubarb Pie of the season. Preparing for the next rhubarb baking, I discovered an omission from my earlier recipe for Rhubarb Cake. [I left out the step where you spread the batter in the pan!] Corrected now. Now that Memorial Day has ushered in the unofficial summer season, I’ve added a few summer recipes to the collection. My Minnesota garden contains more rhubarb than I know what to do with, but I love Strawberry Rhubarb Pie and have included my recipe here. Summer also means Egg Salad Sandwiches, which reminded me to write up instructions for how to cook soft- and hard-cooked eggs. Yesterday was the Indianapolis 500 (aka The Greatest Spectacle in Racing) or “an intimate gathering with half a million of your closest friends” as I like to call it. I miss not being in Indiana during the month of May–practice, time trials, qualifying, race day. This year’s field was filled with too many rookies, newcomers, and idiots, many of whom had difficulty turning corners and entering/exiting pit row. Danica was knocked out by one such knucklehead. Not the most exciting Indy 500 ever raced, but not the most boring either. My Cubbies are holding on to first place in their division, but just barely. Lou keeps making excuses for Soriano’s miserable outfield performance. Easier to listen to when he is on a hitting streak, but when he’s not it’s more annoying than all the other annoying things Lou says . . .